At Jones Motorsports we love our customers and our fans. We want to thank you for doing business with us and bringing your ride in for us to work on, we love it; we love to work on motorcycles, snowmobiles, 4wheelers, UTVs, and personal watercraft. So, thank you for allowing us to work on yours! 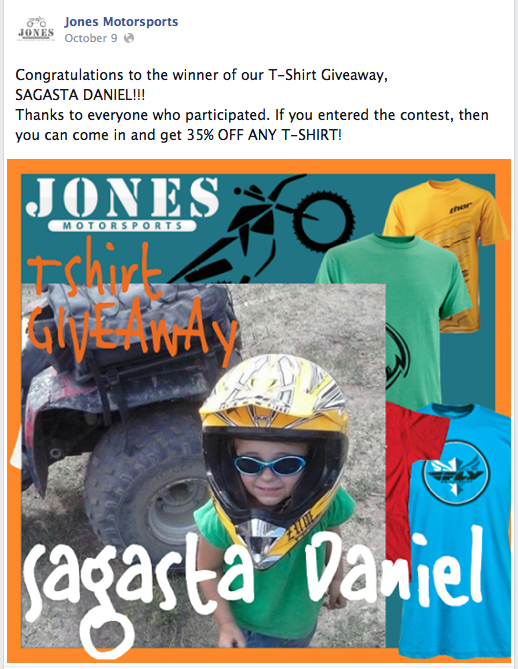 To say THANK YOU, we have regular Facebook giveaways, promotions, and contests where we just GIVE STUFF AWAY! Check out our Facebook page for more details and to see the latest Facebook Contest. Currently, we have our biggest Facebook Giveaway of the year happening, The 12 Days of Christmas Giveaway! With thousands of dollars worth in prizes!